To start out our day, we drove out to Tunnel View. It was really crowded and we didn't stay too long, but the valley with a bit of sunshine shimmering on the snow was lovely. Katie needed to get some interviews done for her documentary, so we traced back through the end of the Valley Loop we hiked earlier in the week and found a few pretty and quiet spots to film in. Perks of having a photographer friend around: awesome behind-the-scenes photos of the making of the documentary, quick uploads from vacations, and ample photos to choose from for profile pics. Cons of having a photographer friend around: The annoyance of having a camera in your face 24/7. I did really like this image of my dear friend Katie, though! It's always great to spend time with her, especially in Yosemite. We decided to go for one of the tougher hikes this day, Upper Yosemite Fall. We only hiked up to Columbia Rock instead of going all the way up to the waterfall. It was pretty strenuous, but it was by far the most gorgeous trail I've ever seen. This was the view when we reached Columbia Rock. On the way back down from Columbia Rock were some of the most breathtaking views I've ever seen. It was definitely my favorite hike of the week, and the best views we got during the entire trip. Toward the end of the trail, we ran into a young man helping an elderly man down the trail. We stopped so Jake could assist the young man, Andy, with helping the older gentleman. While Jake and Andy helped get the older man down safely, Katie and I hung out with Andy's wife and their two deer head chihuahuas, Jax and Lola. 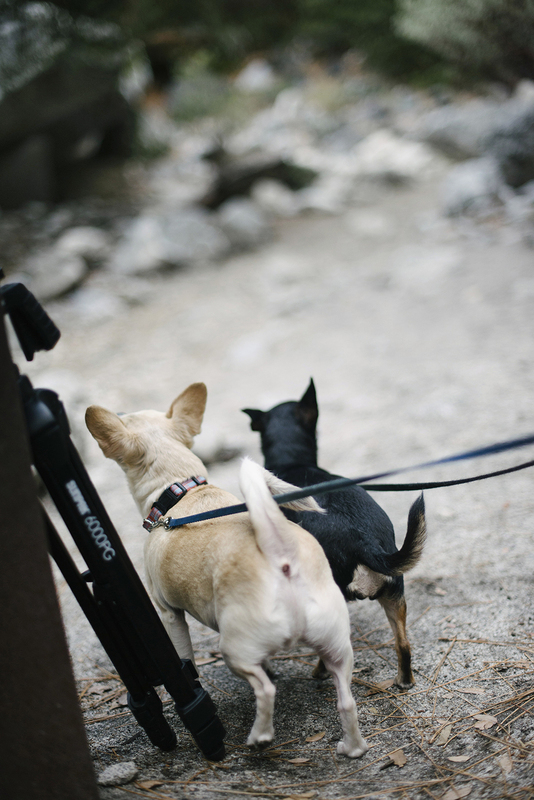 They were so happy to be in Yosemite and we were so happy to get to play with them!